Cuivre, or, cobalt, zinc... le Congo - Kinshasa est une mine à ciel ouvert mais cette richesse des sols profite rarement à la population congolaise malgré les réformes du #code_minier. Alors, entre #multinationales, Etats et population, comment se répartissent les bénéfices de l’extraction ? Mining giant Vedanta’s subsidiary company KCM drilled the borehole in 2010 for the village after the Mushishima stream was turned into a river of acid when mining chemicals spilled into it. But a leaked company letter says that chemists who tested borehole water there in 2011 found it tainted with copper residues, acid and minerals, and said it was unfit for consumption. Now the villagers must use the stream too. 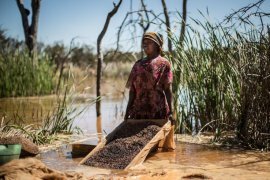 1,800 people from Shimulala, Hippo Pool, Hellen and Kakosa villages took their complaints to the high court in London in a case that could last years and make giant mining companies working in developing countries address local pollution more seriously.